I am quite speechless right now. Justin Case and I have spent all day together with Trevor Eckhart (you may remember him as TrevE of DamageControl and Virus ROMs) looking into Trev's findings deep inside HTC's latest software installed on such phones as EVO 3D, EVO 4G, Thunderbolt, and others. These results are not pretty. In fact, they expose such ridiculously frivolous doings, which HTC has no one else to blame but itself, that the data-leaking Skype vulnerability Justin found earlier this year pales in comparison. Without further ado, let me break things down. Update 10/4/11: HTC posted a public response promising a patch. In recent updates to some of its devices, HTC introduces a suite of logging tools that collected information. Lots of information. LOTS. Whatever the reason was, whether for better understanding problems on users' devices, easier remote analysis, corporate evilness - it doesn't matter. If you, as a company, plant these information collectors on a device, you better be DAMN sure the information they collect is secured and only available to privileged services or the user, after opting in. 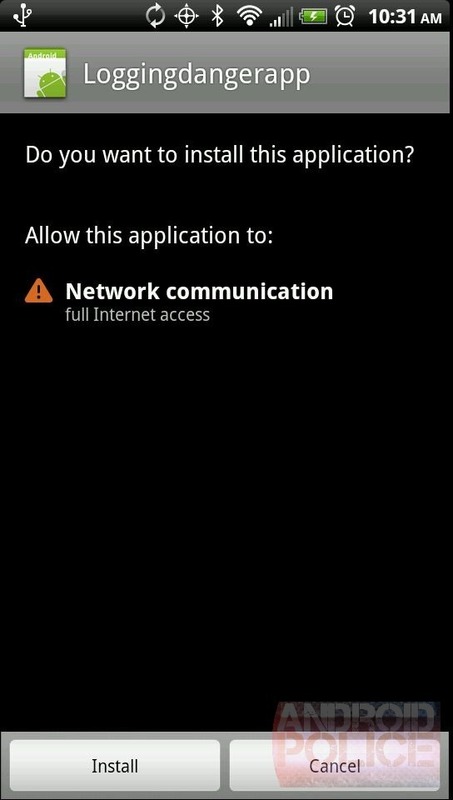 Normally, applications get access to only what is allowed by the permissions they request, so when you install a simple, innocent-looking new game from the Market that only asks for the INTERNET permission (to submit scores online, for example), you don't expect it to read your phone log or list of emails. DUMP Allows an application to retrieve state dump information from system services. GET_TASKS Allows an application to get information about the currently or recently running tasks: a thumbnail representation of the tasks, what activities are running in it, etc. 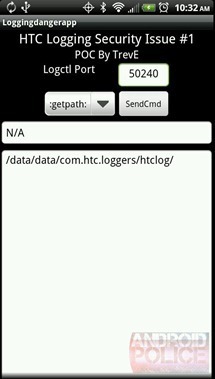 READ_LOGS Allows an application to read the low-level system log files. Theoretically, it may be possible to clone a device using only a small subset of the information leaked here. I'd like to reiterate that the only reason the data is leaking left and right is because HTC set their snooping environment up this way. It's like leaving your keys under the mat and expecting nobody who finds them to unlock the door. For a more technical explanation, see the section below. Additionally, and the implications of this could end up being insignificant, yet still very suspicious, HTC also decided to add an app called androidvncserver.apk to their Android OS installations. If you're not familiar with the definition of VNC, it is basically a remote access server. On the EVO 3D, it was present from the start and updated in the latest OTA. The app doesn't get started by default, but who knows what and who can trigger it and potentially get access to your phone remotely? I'm sure we'll know soon enough - HTC, care to tell us what it's doing here? 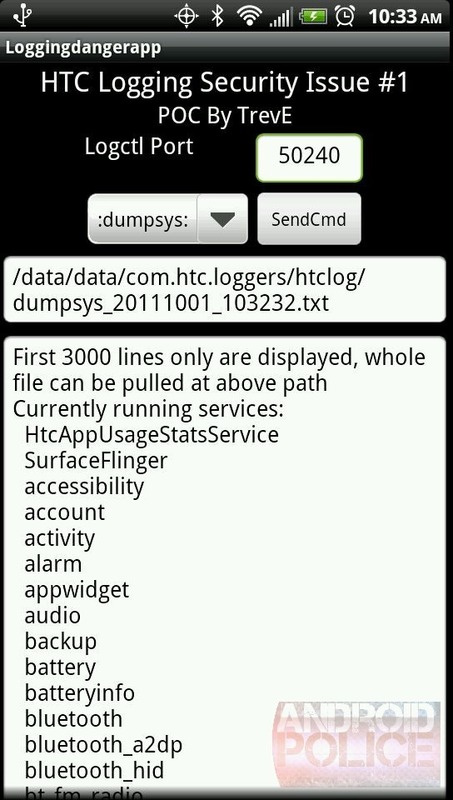 In addition to Carrier IQ (CIQ) that was planted by HTC/Sprint and prompted all kinds of questions a while ago, HTC also included another app called HtcLoggers.apk. This app is capable of collecting all kinds of data, as I mentioned above, and then... provide it to anyone who asks for it by opening a local port. Yup, not just HTC, but anyone who connects to it, which happens to be any app with the INTERNET permission. Ironically, because a given app has the INTERNET permission, it can also send all the data off to a remote server, killing 2 birds with one stone permission. In fact, HtcLogger has a whole interface which accepts a variety of commands (such as the handy :help: that shows all available commands). Oh yeah - and no login/password are required to access said interface. 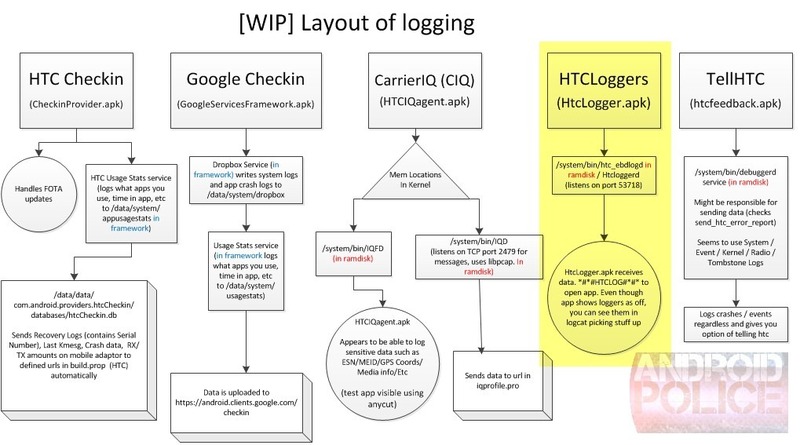 HtcLoggers is only one of the services that is collecting data, and we haven't even gotten to the bottom of what else it can do, let alone what the other services are capable of doing. But hey - I think you'll agree that this is already more than enough. In order to help showcase his findings, TrevE created an open-sourced POC (proof of concept) of a simple app that requests a single INTERNET permission, then shows that it can gain access to all the data I mentioned above. 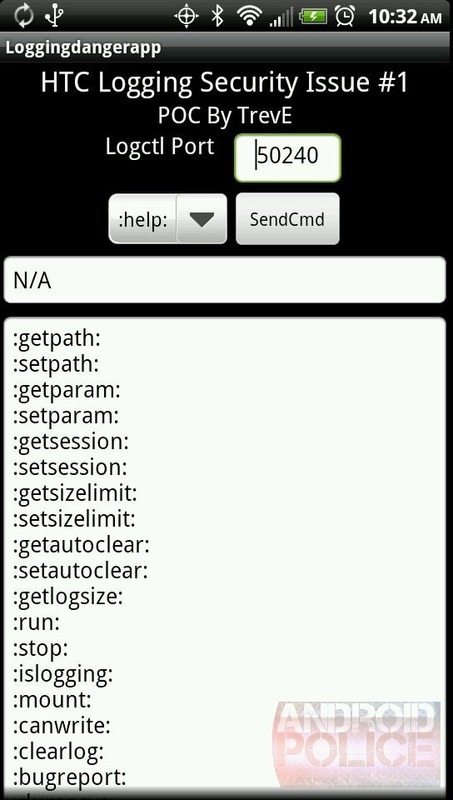 I ran the app on an unrooted EVO 3D - see the screenshots below or try it out yourself. There is also a video walkthrough below the screenshots, shot by Trevor himself. 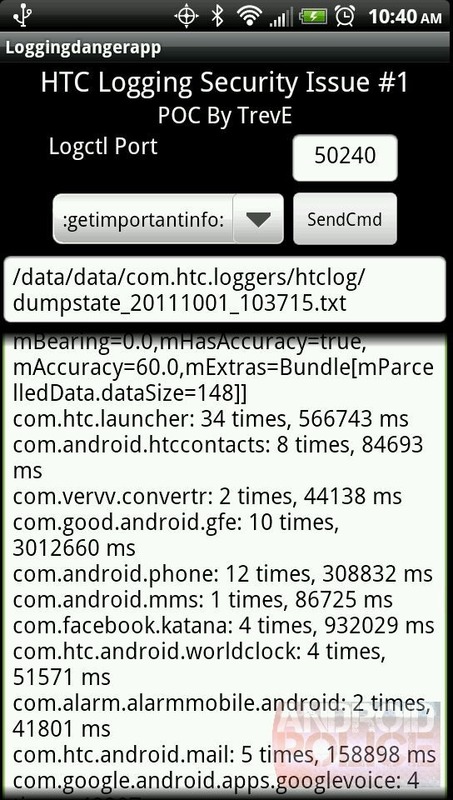 ... is not possible without either root or an update from HTC. 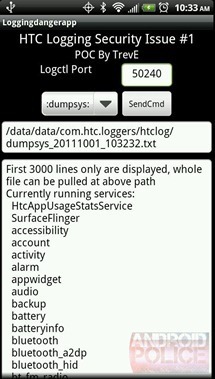 If you do root, we recommend immediate removal of Htcloggers (you can find it at /system/app/HtcLoggers.apk). Stay safe and don't download suspicious apps. Of course, even quality-looking apps can silently capture and send off this data, but the chance of that is lower. Note: Only stock Sense firmware is affected - if you're running an AOSP-based ROM like CyanogenMod, you are safe. As far as we know, HTC is now looking into the issue, but no statement has been issued yet. HTC, you got yourself into this mess, and it's now up to you to climb out of the hole as fast as possible, in your own interest. Huge thank you to Trevor Eckhart who found the vulnerability and Justin Case for working with us today digging deeper. 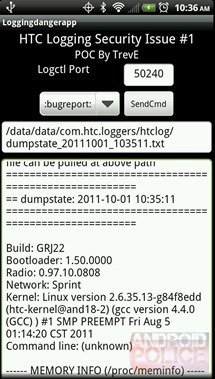 Update: Another contributor, Egzthunder1 of xda, who helped submit the issue to HTC, was pointed out to us on 10/5/11. Just to be clear - this person's involvement was not known to us at the time of publication, and we were working only with the main researcher - TrevE. You can get more information about xda's public accusation and our response here.